My wife Michelle and I are proud to announce the arrival (three and a half weeks early) of our son Colt William Karl Mueller. 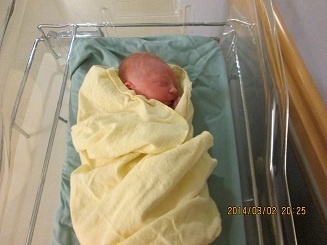 Colt was born on March 1st 2014 @ 1823hrs CDST and was 5 lbs 3 oz and 20 inches long, blonde hair and blue eyes. If this is your first, I hope you banked a lot of sleep before having this baby because there is going to a lot of sleep withdrawls. If this isn't your first..then...well, see the first paragraph anyway. But you probably already know that. Congratulations! Glad he delivered happy and healthy. Its a fun time when they are that small, enjoy it! Congrats to the baby boy! Its a BOY its a BOY its a BOY!!!! Congratulations, you have a new hunting buddy. What a manly man name! Beautiful kido too! It's a great age for molding them like clay for photos. You can pose him any ole way you want while he's sleeping and take some great photos. I just saw one this morning of a baby that is sound asleep but they posed him on his stomach with his head propped up in his hands (elbows on the bed, chin in hands) it's so cute! Have fun InTheDark and congratulations! Now wake that young'un up an' put 'im t'work! Congratulations to both Michelle and yourself ITD. You will find that the next 12 months will be the most enjoyable and fascinating of your life mate, watching wee Colt developing a personality. The next phase is the start of a tremendous period lasting many many years, a period of growth, learning and teaching...you both will love it mate. May I suggest: when Colt makes a .22 Hornet it would be a good thing to get your son started... maybe Sierra's 45 grs bullet for the small game and run some tests with Barnes for heavier stuff (I would say pigs upto 60 kg/130 lbs). So there might be some truth in: "in the dark gives you boys, in the light makes you copy the model..."
Congrats to you both, enjoy them while they are small..dont forget to have Mum & Dad time over the next few months..Grandparents are always keen to watch over newborns while you nip out for a coffee or a movie or just time out. Welcome to the world Colt.